An incident in which China's under-20 soccer team stormed off the field until a protest involving the unveiling of a Tibetan separatist flag in the stand at a stadium in Mainz, Germany, was dealt with, aroused much attention. However, the players' action on November 17 was completely justified. 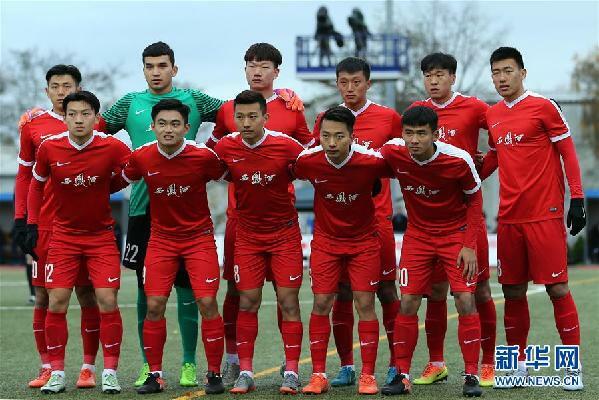 The incident caused much embarrassment for the organizers of the match, one of 16 the Chinese team is playing against lower-level teams in Germany between now and next May in preparation for the 2020 Olympics in Japan. However, Western observers should be able to easily understand why the players took their action, if events are explained in the proper context and with appropriate background. Imagine that a group of American basketball players were about to play a game in another country, when fans in the audience unfurled the infamous southern Confederate Flag. It would be completely understandable for the American team to refuse to play until this offensive symbol was removed, especially if the team contained African-American players. The Confederate Flag in the United States is a deeply offensive and polarizing symbol. It is associated with a conflict in which somewhere between 750,000 and 850,000 people lost their lives. This symbol was displayed by insurgents who took up arms against the U.S. government in order to preserve the evil practice of chattel slavery. Well, if the actions of American athletes in the hypothetical situation I have outlined can be understood, then that of the Chinese soccer players in Mainz is equally acceptable. They refused to play until the symbol, associated with so much violence and death, and yet still waved by people seeking to break China asunder, was removed. The action makes complete sense when considers the actual history of Tibetan separatism. Fighting in the Tibet Autonomous Region between foreign-backed extremists and the Chinese government took place throughout the years from 1956 to 1962. Gyalo Thondup, brother of the Dalai Lama, led a group of fighters who'd been given military training in Colorado as part of the CIA's Tibetan program and approved by the 303 Committee of the U.S. National Security Council in 1958. When religious fanatics, trained and armed by the United States, took up arms against the People's Republic of China in 1959, it is estimated the subsequent fighting resulted in over 85,000 deaths. In other episodes of violence, Tibetan separatists and extremists have randomly attacked people they perceived as being Han Chinese. Such acts of violence directed against people on the basis of their race are called "hate crimes" in the American legal system. "We are firmly opposed to any country or any individual offering support to separatist, anti-China and terrorist activities or activities defending Tibet independence, in any form or under any pretext," said Foreign Ministry spokesperson Lu Kang on November 20 when referring to the Mainz incident. His words make a great deal of sense to those who understand how politically loaded such symbols are to China and its people. In the Tibet Autonomous Region each year, the people celebrate March 28 as Serf's Emancipation Day. This is the day on which Tibet launched its democratic reforms, and the practice of feudal serfdom, not far short of outright slavery, was abolished. At the time, American Journalist Anna Louise Strong directly observed the events, which she wrote about in her book "When Serfs Stood Up In Tibet," published by New World Press in 1960. Today, Tibet is flourishing as part of the People's Republic of China. The poverty alleviation program has already provided modern housing to 236,000 Tibetan families. Meanwhile, the $36 billion Sichuan-Tibet Railway project is under construction as part of the 13th Five-Year Plan (2016-2020). Tibetan culture is flourishing, and tourists from across the world are visiting the region to learn about its history. With central government help, the Tibet Autonomous Region has moved well beyond the violence, poverty, and terrorism associated with the symbol unfurled by four spectators in the Mainz stadium. Poverty alleviation, infrastructure, and the cultivation of Tibet's unique historical culture are pointing toward a better future for everyone in China. Yet, certain people in the West, with a confused and distorted understanding of the region and its history, seek to stoke up tensions once again. More conflict and separatism will not be good for Tibet, the rest of China, or, indeed the world. China's under-20 soccer team refused to continue their match against a local side until a Tibetan flag raised at a football match in Germany in protest against Chinese policies in Tibet was removed. This was surely justified.